Next gen of the Ultra HD now comes with a 25% thinner body and image stabilization; is the original still the best? Why mess with a winning formula? Hence the new Flip UltraHD from Flip Video appears much the same as before, packing 8GB of integral memory for up to two hours of 720p HD footage in widely accessible MPEG4 file format, rather than Full HD, yet with stereo sound and a frame rate of 50fps. Though you wouldn't immediately twig, the new design is 25 per cent slimmer, and it now comes with image stabilization to avoid jerky pans. More noticeable is a velvety smooth surface coating carried from front to back and an altogether less plastic-y feel than previous Flips. An unprotected HDMI port features at the base next to the screw thread for a tripod, and a lock-style catch for protecting the data stored on its internal drive against accidental deletion. Slide a finger along the catch to the right of the lens and the formerly hidden USB arm pops out at right angles. Once again, this is the method by which footage is not only downloaded to your PC or uploaded to the social networking site of your choice, it's also the means by which the internal battery is recharged. The power button is located on the flank of the camera to the left of the lens – if viewed front on. At the bottom of the same strip there's a lug for attaching a wrist strap. Press the button and the Flip readies itself for action in around two seconds, screen bursting into life with a cheery 'chirp'. Keeping operational matters ultra simple, key buttons are few. There's a can't-miss-it red record button centre of the backplate surrounded by a four-way control pad that not only allows users to scroll through functions and captured footage, but also acts as a zoom lever. It's the only control that isn't more or less flush with the bodywork. Flanking this is a playback button to the left, which confusingly also doubles up as the 'OK' button; a dedicated delete button with familiar trashcan icon located to the right. If there's a disappointment It's that the LED screen appears relatively tiny at 2-inches – with a resolution of just 320x240 dots it certainly lacks the wow factor of the JVC Picsia GM-FM2. That said screen visibility is crisp and clear, though of course a larger one would have enabled us to see detail better. You really do have to squint. When filming, the slightly off-centre positioning of the lens at the front also means that stray fingertips can creep into shot if holding the UltraHD one-handed, and it soon becomes smeared with prints. The zoom action is smooth and steady, and, the upshot of it not packing an optical zoom is that operation is dead silent. However, the built in microphone's sensitivity is such that it does pick up the movement of your fingers across the camera's surface, not that this would be noticeable in busier environments. What's particularly cool however is a red recording light – think of a TV studio camera – that glows through the mesh-like design to the right of the lens when you hit the record button. 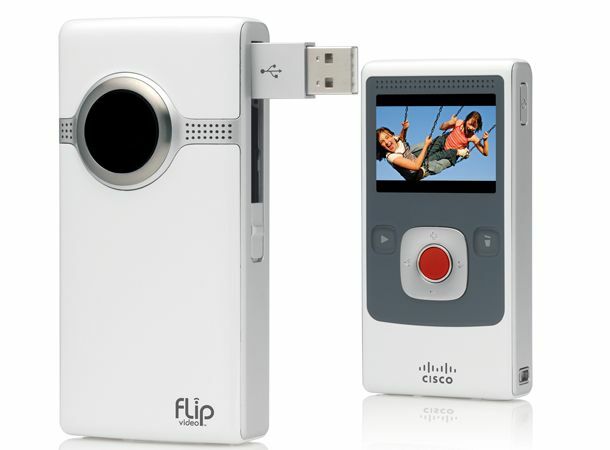 If this isn't for you, it can be deactivated via the camera's set up menu, the accessing of which involves holding down the main red record button upon powering up the Flip. In common with other Flip devices image quality is acceptable if not on a par with more expensive models with bigger sensors and better lenses. Picture-wise colours lack punch but the slightly larger lens than that offered by rivals lets in more light, so we were able to get better results in dimmer conditions. Also on the plus side, you don't need any qualifications to use it and it's fair value for money. The Flip Ultra HD is the no brainer portable video option at a fair price, but could do with a larger screen and of course Full HD capture capability.